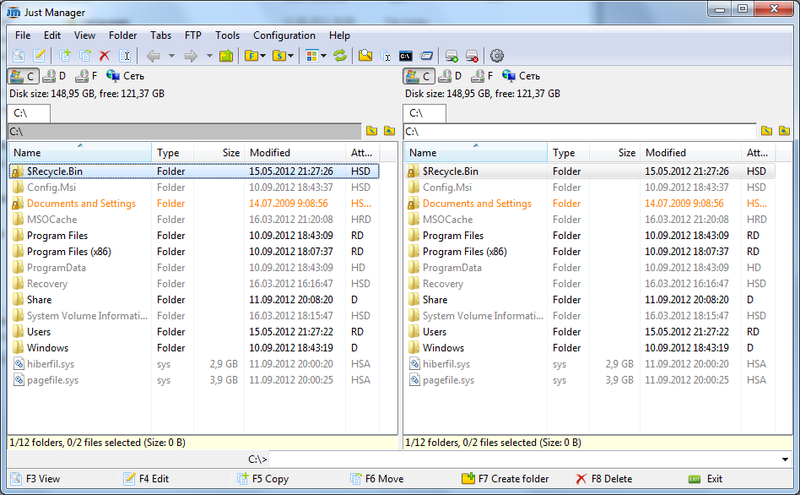 Just Manager is a file manager for the Windows operating system. Features include Multi-panel interface, Panel tabs, File operations, File search, Quick search, Multi-rename tool, FTP, and a Customizable interface. Very pleased with your progress. I use Free Commander and one of the features I miss most in Just Manager is to assign a default folder in both panes at program start. Wow, very good utility. Very useful tool this for everyone. But one suggestion: Please add the mobile phone explorer to manage the mobile phone contents. After adding my suggestion, i will give 5 star to this. Existing features work almost perfectly although this is just an alpha. Looks like this piece will never ever have any betas before a final release is made. I would really appreciate if the developer could add two more features to this wonderful tool. It would then be perfect IMO. One is the ability to accept files that are dragged and dropped from other software windows, such as Winzip. 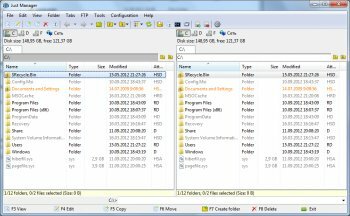 I find I am unable to extract any file by dragging it from the Winzip window into this window. Secondly I would really have liked a feature to apply a filter that lets me see only files with names that contain a string of characters. This is one feature I miss, which is available in Free Commander. Light, fast file manager. Looks like Total Commander. Due to lack of a quick button for Windows Desktop, I give it 4 stars. It's slim, fast and though basic, has great potential. @: Heilnazar: Is your last name McCarthy or what? Just Manager is still in alpha stage yet it is a very promising file mamager. Its developer, mr Leontiev, is very responsive and helpful. Just Manager has the potential of becoming one of the best file managers available. HeilNizar, it's obvious that you are an idiot. Saw Russian language in screenshot, so noway. Great potential. Already a very capable file manager. Compared this with Free Commander and found very few things that I miss. Would really appreciate if the developer could include one small feature > Go up one level in directory on Dbl click in a blank area. What????? No more than 5 stars???????? Wow! 800kb and yet so powerful and even so for free! Kudos to the author. This is Windows explorer replacement and multipane replacement. 2 in 1 I should say. Too good to be true. The author is proactive. I have requested for a feature (double in empty space to return to parent folder) and got a response almost immediately saying it will be implemented in next release. Too too good!